Yesterday, my friend Terry shared a poem on Mastodon. His poem, enriched by the video he added, started a rich conversation that leaped across platforms through the day. He later wrote a blog post that tracks the flow over the day of wandering and wondering. Later, I created the treasure map above as a sort of additional visual connection, and then I started to think about how else to think through this kind of platform adventure that began with a poem. I know he and I are sort of geeky like this, pushing our thinking back and forth and exploring the terrain. As I read his post a few times, and thought about the unwinding of our words, I had this inspiration for a picture book story. 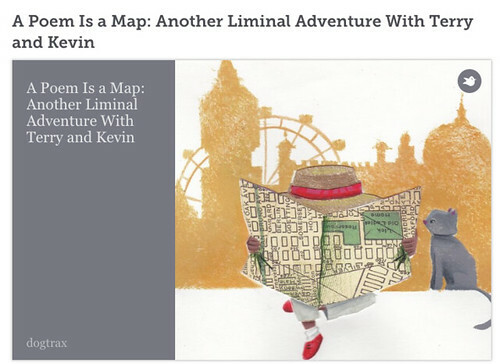 So I made one in Storybird — using a keyword art search for “map” — and entitled it A Poem is a Map. What’s interesting about Storybird is that the art collection and choices come first in the making of stories, guiding the writing through the visuals. Except here, I had a story in mind – about how poems are maps, which forms one of my points in our discussion and which sparks a question from Terry — and I needed art. You can only access collections of art in Storybird (that is part of its interesting design), not keep searching its entire collection as you build a book. The keyword “map” brought up some interesting art but it was limited in scope. In making this picture book, I had to dance between Terry’s ideas, our conversations, my story concept and the available artwork. The tension between the freewheeling concepts we were exploring and the limited nature of Storybird made for an interesting writing experience. I simultaneously wrote what I knew I would write and let the art push me in different directions. In the picture book, you can notice me weaving in the conversation and some of Terry’s reflection points from his blog. It’s a story that could stand on its own, perhaps, but also be read as yet another threshold, as Terry called it, of the conversation. Maybe this isn’t the end. Maybe this is just the start. I passed a few thresholds to get here today. Terry’s Tweet led to his blog. Your Tweet led here. Storybird is new creative tool that I’ve not seen. Enjoyed reading your story.